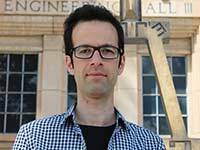 Majid Karami, a Ph.D. candidate in the Department of Civil and Architectural Engineering at the University of Wyoming, recently was awarded the American Society of Heating, Refrigerating and Air-Conditioning Engineers (ASHRAE) Grant-in-Aid award. Each year, only 10 to 25 applicants from all over the world receive the prestigious award. Karami, who is originally from Iran, says he believes this is the first time the grant has been awarded to a UW student. His research focuses on developing online learning-based fault detection and diagnostics method in building HVAC systems, under the supervision of Assistant Professor Liping Wang. The $10,000 grant is awarded to full-time graduate students who are involved in studying or researching innovative ASHRAE-related technologies. The awards are meant for the students’ personal use while pursuing their education. The goal of the program is to encourage outstanding graduate students to become involved in ASHRAE and its research, and establish careers that include active engagement within and continued contributions to society activities. Part of the award is used to pay for student travel and registration for one society winter or annual meeting within 18 months of receiving the award. In addition, recipients are eligible for an additional $1,500 if they author and present a peer-reviewed paper at an ASHRAE annual meeting or submit an article that is published in the journal Science and Technology for The Built Environment. The evaluation criteria for honorees include a full-time graduate course load, academic performance, quality of the student’s thesis/research plan and its relevance to ASHRAE, an advisor recommendation, and an overall assessment of the likelihood for future involvement of the student within ASHRAE.